Absolute freedom from corrosion and staining, which can often occur with galvanised steel beads during a lengthy drying out process. How do costs of PVCu beads compare with stainless steel beads and galvanised steel beads? Used externally, they are simply the most economical beads you can buy. For plastering and drylining, they are comparable in price to galvanised steel beads, but with far less wastage from casual damage on site and in transit, and zero staining during lengthy drying out times, PVCu beads are the best value option. 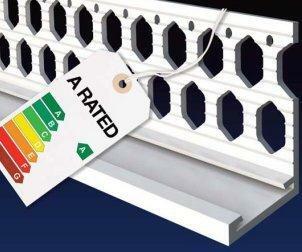 Are PVCu beads approved by any national authorities? The national standard for external rendering is BS EN 13914-1:2016, which permits only stainless or PVC beads to be used in all situations. Click on this standard, highlighted on our home page for further details. My local merchant only sells galvanised beads and stainless steel beads, but I want to try your PVCu beads. What can I do? Get in touch with us! Alternatively, ask your merchant to do so! More and more merchants are selling PVCu beads so don't let your local merchant get left behind. I haven't an account with Renderplas. What's required? Phone or Fax us! If we can't find a suitable distributor for you such as who you are buying your render from, we can set up an account for you in minutes. My plasterers never give me enough notice before they run out. What's the service like for PVCu beads from Renderplas? We currently have close to one million metres of PVCu beads in stock and we promise to deliver the next day by carrier for smaller orders if we receive your instructions by midday. The architect has specified stainless steel beads and not PVCu beads. Surely he knows best? Very doubtful! If through-coloured render has been specified, he will face consternation to see a silvery arris on the corner. What price aesthetics? Talking about price, why does he inflict up to a 50% cost increase unnecessarily on his client versus PVCu beads? I'm wary of using new products. How long have PVCu beads been around? Renderplas was established in 1990, solely to introduce British made PVCu beads to the UK market. In America, they have been used for over 70 years and are now the preferred type in use there. We are not aware of any product failures in all this time. I'm using sand and cement and finishing with paint. Will this flake off PVCu beads? Absolutely not! Have you ever tried to remove emulsion from a PVCu window? Are PVCu beads environmentally friendly? Firstly, our white PVCu beads are 100% recycled made from re-granulated window grade material and all packaging and offcuts can be recycled. Used PVCu beads can also be recycled when buildings are deconstructed making them 'Part L' friendly. How are PVCu beads fixed to the wall? Adhesive mortar dabs at 500mm centres will sometimes be used, though bedding into a continuous line of mortar provides more stability when vigorously trowelling off. PVCu beads are so much simpler to cut, and without the blood! I usually have to order up to 15% more beads than needed due to damage on site. Can PVCu beads help avoid this? Emphatically yes! PVCu beads are almost impossible to crush accidentally and retain a 'memory' when flexed. I use arch formers which are very expensive. Is there an alternative PVCu bead? Use our CB2A skim arch bead, which will go around a radius down to 200mm. Cut the plasterboard accurately, fix the bead, and you can skim straight onto the perfectly formed arris for less than the cost of a pint. Where can I see where these PVCu beads have been used? The odds are where any self-coloured render has been used, there will be a PVCu bead. Also on such sites as Chelsea Harbour Village, New Museum of Scotland, Portrait Gallery of Ireland and many Westbury Home sites up and down the country-the list is growing fast every day. I am an overseas buyer. Can you supply PVCu beads to us? About half our sales of PVCu beads go to Ireland, Germany, Benelux, Scandinavia, and the Middle East. Contact us please! I want to specify an ivory render, but do not want the beads to be prominent. Can PVCu beads help? We stock all external PVCu beads in ivory colour - even movement joints - which means they blend perfectly with ivory, sand, buff, beige and cream renders. Do galvanised beads ever meet the British Standard for External Rendering? BS EN 13914-1:2016 - External Rendering stipulates that only galvanised beads that are hot dipped after fabrication can be used. They are not suitable for conditions of high humidity and salt in the air or background substrate. PVCu beads can be used in all situations. Which profiles are standard angle beads? Renderplas has revolutionised beading design so that there is no standard angle or corner bead. There is a PVCu angle bead or corner bead for each render depth. See the "Our range" section of this website for more information. We are using a through-coloured render but cannot find a stainless steel bead to match. What can we do? PVCu beads are ideally suited for through-coloured renders. Our external PVCu beads are available in 9 natural colours, even expansion beads. I'm an architect and I want more details on PVCu beads. What next? You can download technical drawings directly from this site to use with your CAD program. Alternatively, please contact us to receive a brochure detailing all our PVCu beads. Site Map | Legal | Renderplas Australia | Renderplas Germany Renderplas Ltd, No. 2, 70-72 High Street, Bewdley, DY12 2DJ.